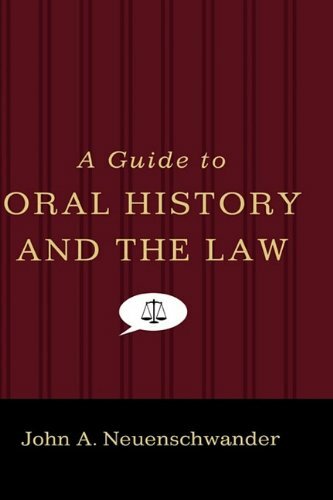 [PDF] A Guide to Oral History and the Law (Oxford Oral History) | Free eBooks Download - EBOOKEE! Description: The Oral History Association published the first edition of Oral History and the Law as a 24-page pamphlet in 1986 a second edition (53 pp.) in 1993 and a third edition (93 pp.) in 2002. The need for an expanded, book-length treatment is evident, not because of an upsurge in litigation, but because of the vast expansion in the practice of oral history and the new ways in which interviews are being utlized. Like any growth industry in America, oral history is inevitably intertwined with the legal system from prevention through litigation. This book covers legal release agreements protecting sealed interviews and anonymous interviews from courtroom disclosure defamation copyright the Internet Institutional Review Boards (IRBs), oral history as evidence the duty to report a crime and teaching considerations. It also includes examples of best practices and legal precautions, using case studies to illustrate each point. 2018-07-31A History of the World in Seven Cheap Things: A Guide to Capitalism, Nature, and the Future of the..
No comments for "[PDF] A Guide to Oral History and the Law (Oxford Oral History)".